The Milton Cold Water Steriliser comes highly recommended by professionals and is widely used by the NHS in hospitals across the United States. The unit itself comes with a lockable lid which helps to keep the water & solution in and the items sterile for up to 24 hours. The weighted grid contained within ensures that the sterilised items are kept in place and submerged to retain the sterilisation. The container will hold a good number of bottles (depending on the brand you are using) and is very strong and sturdy. There are clear indicators on the unit to show you where to fill the water up to making the process very easy. The process of sterilisation for the Milton Cold Water Steriliser is very straight forward, you simply fill the container with water and add a Milton Sterilising Tablet or the Milton Sterilising Solution. Once the bottles and other items are in the steriliser, they will be sterilised in 15 minutes. You can then leave the items in the solution and they will remain sterile for up to 24 hours – providing you ensure all items are completely submerged. Should you wish to remove items all at once so you can prepare baby’s bottles then you can re-use the solution for up to 24 hours. 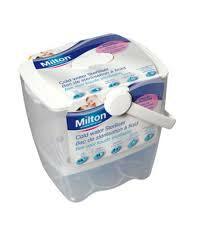 This make the Milton Cold Water Steriliser very practical and cost effective. Some parents have said that the solution leaves a slight smell and peculiar taste that their baby has been turned off by. I should not that the majority of parents using the Milton Cold Water Steriliser haven’t reported any issues in regards to this. You may question how cold water can sterilise baby items when all other methods focus on heat to achieve the same outcome. You can rest assured that this method is tried and test is clinically proven to kill 99.9% of germs including bacteria, fungi and viruses. When travelling, the handle forms part of the lid locking mechanism, helping to secure bottles, etc if in the car boot for instance. All in all this steriliser is a low cost, convenient method of sterilising baby bottles and other items. You may wish to purchase one as a second steriliser for use when travelling, removing the need to find a socket or have a microwave on stand by. Whichever reason you decide to buy, the Milton Cold Water Steriliser is easy to use and won’t let you down. If you’ve decided that a cold water steriliser isn’t for you then check out my in-depth guide to all types of baby bottle sterilisers.